Let’s set the stage. San Francisco, California. The year 2000. Three friends form a band that would come to be known as The Lucky Stiffs. Greg De Hoedt, Sean Von Smith and Aaron Argandona set out to carve their own niche in the world of music, relying on determination and do–it–yourself ethics. They recorded their first EP, entitled “Tell Your Mom I’m Sorry,” only three months after forming the band. Over the next year, The Lucky Stiffs unfortunately parted ways with the Shinnister due to some personal obligations back in Japan. They also suffered two separate robberies of the band’s equipment. But in spite of it all, The Lucky Stiffs were determined to continue pursuing the growth of their band. As others began to assist with touring responsibilities, the band had the freedom to search for a more secure line up; enter, Tony Teixeira and John Paul Mangano a.k.a. the Pope. 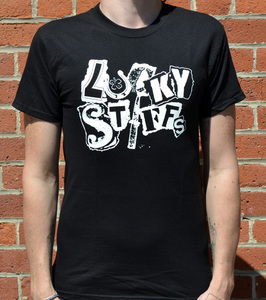 With a newly solid team and friendships in place to boot, The Lucky Stiffs signed to Pirates Press Records. They were offered to record their debut LP, “Gold In Peace, Iron In War” in the traditional fashion, but opted to record it themselves in a smoky, homemade, converted pool shack studio, located across the street from a cemetery in Lodi, New Jersey. Wanting to return to the days of DIY recordings, this was their musical rebuttal to the over–polished “punk” records of the day. Knowing that most people wouldn’t understand the reasons behind the “purposely amateur–sounding” recording, they set out to release their version of the raw and unpolished punk rock sound they remembered from the days of their youth. Gold In Peace, Iron In War” debuted on Halloween in 2006, and The Lucky Stiffs then set out on a 35–day U.S. tour to promote its release. After a gracious welcome from old and new fans, The Lucky Stiffs returned to San Francisco to regroup for their next tour. Then, no less than five days before Christmas, disaster struck for the third time, and just three days after playing a benefit show the band was robbed of all its equipment once again. 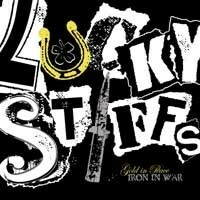 Despite the many setbacks they have endured over the past six years, The Lucky Stiffs have persevered and proven themselves to be a band with talent and resilience.